#336 "Waaagh! The Orks, Flying Creatures, LoTR Movie Moments"
All the latest models from the Citadel forges. 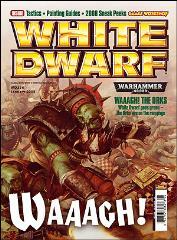 Ork Warbosses Brainbiter and Gitkilla are set to unite to form a mighty Waaagh! Can Tigurius stop them? A look at what’s coming up in 2008. Inspirational scenes for your battle games. We ring in the changes to the Citadel range. Jervis invites you to try a game or three. Introducing some low cunning for high flyers. The Warden of Tor Yvresse, step-by-step. The latest events and activities near you!